Over the past month, we have had several entries. We have rallied together an international set of both contestants and judges. And here are the results! First of all, let’s list the applications that were submitted (in alphabetical order). This app is used for piping various types of traffic over different systems. It leverages Spring Boot’s conditional settings, allowing the user to customize as needed. It also has a hypermedia-based RESTful API. This application is a bot that listens in on chat sessions to count votes for/against spontaneous activities. That way, they can quickly get a tally of who all is going/not going on the fly. It has a pluggable architecture, comes with a video demo on an Android smartphone, uses Project Reactor, and leverages Spring’s profile support. Each of these apps was top notch. The contestants showed real skill. As judges, it was very hard because each team went in a different direction. Spring Boot offers a lot of concise and flexible power, and each of the entries used it well, just differently. And the winner is…..Polaromatic! If you want to see, the winner has a running copy here. Visit it and simply wait a few seconds to see the outcome. 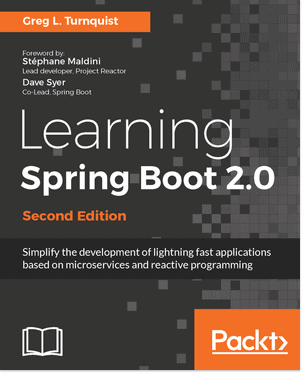 The team behind Polaromatic has won a free copy of Learning Spring Boot.